"For extraordinary heroism in action as a Picket Ship on Radar Picket Station during coordinated attack by approximately twenty-five Japanese aircraft near Okinawa on May 3, 1945. Shooting down two Kamikazes which approached in determined suicide dives, the U.S.S. AARON WARD was struck by a bomb from a third suicide plane as she fought to destroy this attacker before it crashed into her superstructure and sprayed the entire area with flaming gasoline. Instantly flooded in her after engineroom and fireroom, she battled against flames and exploding ammunition on deck and, maneuvering in a tight circle because of damage to her steering gear, countered another coordinated suicide attack and destroyed three Kamikazes in rapid succession. 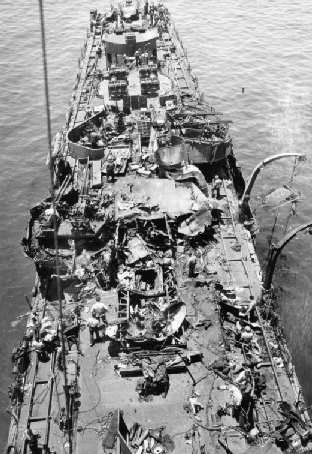 Still smoking heavily and maneuvering radically, she lost all power when her forward fireroom flooded under a seventh suicide plane which dropped a bomb close aboard and dived in flames into the main deck. Unable to recover from this blow before an eighth bomber crashed into her superstructure bulkhead only a few seconds later, she attempted to shoot down a ninth Kamikaze diving toward her at high speed and, despite the destruction of nearly all her gun mounts aft when this plane struck her, took under fire the tenth bomb-laden plane, which penetrated the dense smoke to crash on board with a devastating explosion. With fires raging uncontrolled, ammunition exploding and all engine spaces except the forward engineroom flooded as she settled in the water and listed to port, she began a nightlong battle to remain afloat and, with the assistance of a towing vessel, finally reached port the following morning. By her superb fighting spirit and the courage and determination of her entire company, the AARON WARD upheld the finest traditions of the United States Naval Service."